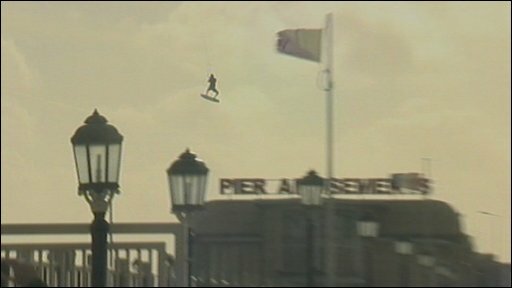 2 kitesurfers jumped over Worthing Pier in the UK. The winds were gusting at more than 40 mph and the 2 kitesurfers, Jake Scrace, 25, and Lewis Crathern, 24, who had been thinking about this jump for more than 3 years but had had to wait for the perfect conditions, were out there like a flash (MadHotNews). Both Scrace and Crathern have, between them, 16 years experience of kitesurfing, but they both admitted that the jump was potentially hazardous and should NOT be attempted by amateurs. Crathern said the jump was “epic”. “It was everything I’ve lived for – amazing,” he enthused. Worthing Pier, for those sticklers out there, was originally built in1862 but has subsequently been modernised and added to. It’s width is now 9.2m, and the pier head was increased to 32m to allow for a 650-seat pavilion to be built. Walking on water? Who doesn’t want to do that (belgiumdreamwind)?